Started in Aikido at the Hombu Dojo in 1951 and by 1955 was promoted to shihan. Nishio Sensei worked at the Yokohama Mint for a great many years. He started during the war, probably while he was still in high school. In an Aiki News magazine article, Sensei states that he practiced Karate and Judo very diligently throughout the 1940's. One day one of his very respected sempai (senior student or sensei) came in and told him "I met a ghost! You have got to go see this man!" Shoji did go to see O'Sensei. Then he says he never returned to Karate, yet there are Karate and Judo elements sprinkled liberally throughout his Aikido. Some time in the late 1950's or early 1960's A respected sensei of Karate, Judo and Iaido who ran a (prewar) hotel in Yokohama requested a teacher of Aikido be sent to teach in his Dojo. This was the Matsuo Dojo which was about a 10 to 15 minute walk from the Yokohama train station. Nishio Sensei taught there until the dojo and hotel were closed in the spring of 1992 to be rebuilt as a modern hotel. The Matsuo Dojo became famous in the early 1960's because they had national champions in multiple arts Judo, Kendo, Karate and perhaps other arts, for multiple years. Every year Sensei would travel to various countries in Europe, Sweden, Denmark, Finland, Ukraine around the U.S., Mexico and perhaps, at one time or another, South America as well, maybe Brazil. 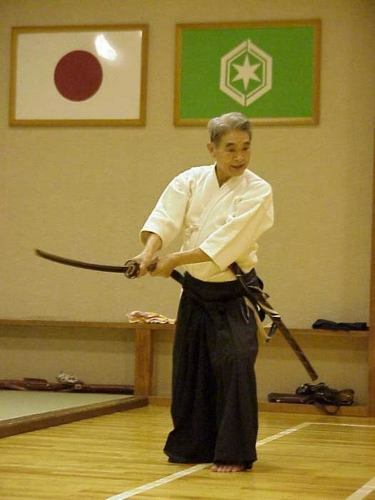 Various Videos of Nishio Sensei These videos are captured from the web. I did not put these up, I'm only directing you to them. Some of them are obviously Aiki News or Aikido Journal. The videos I put up were filmed from my camera. Nishio Sensei, in the samurai frame of mind, did not seem to be concerned with expansive monetary gain from what he developed. Perhaps because he was in continual development and improvement, Kaizen. (What he was doing today, might not be what he would be teaching tomorrow.) Perhaps he was more concerned with continuing development and disemination of O'Sensei's art. By not stipulating limitations, the art and geniuses of O'Sensei and his students gets disseminated faster and farther. In the larger frame of things, O'Sensei was developing geniuses and his students are expanding and developing more geniuses. Below are some videos I recorded while I was training with Nishio Sensei. I have much more video on VHS type tapes. In order to retrieve them I need to have them converted to digital video. This costs about $50 per tape. I currently struggle to keep the doors of the dojo open, so these tapes are not being converted. If people wishing to see more tapes donate funds then I can start to have the tapes converted. ﻿﻿ Please enjoy the videos I have gathered here. This video and the Part 2 were done in the late 1990's or early 2000's. Since the location backgrounds are so similar, I assume that these were done in the same time frame that the Aikido Journal Nishio Style AikidoTechnical Videos were completed. There are some differences to the final Iaido videos done in Europe. The final sequence also changed from this video to the European videos. Some will say you "must" use the last videos. I am of a different opinion. To me, all are relevant and may document that Nishio Sensei was ever changing. This was his philosophy and I'm OK with that. I look at the changes as variations. I would like to keep most of the variations. If the variation defies a basic principle or presents various dangers, then it may be discarded. Otherwise, I would like to have a large repertoire of techniques. Therefore, I still practice many of the older forms and build on top of some. Some of the old ones are just a lot of fun to know and practice. These two videos are from the Ukehashi Aikido. The operator of this You Tube channel maintains a lot of Nishio Sensei videos so it is a good site to subscribe to. An interesting observation I found was that when Nishio Sensei shows the form in slower motion there may be some variations in what appears. I noticed this because if you click on the little gear wheel in the lower right corner, there is a speed setting that appears and you can slow the speed of the video down to 1/4 speed. This allows you to observe movements in finer detail and a number of the details that I teach, but don't show at his regular speed, begin to appear. Watch how the wrist turns during the draw, how he moves the saya back across his center after the draw, how he brings the sword over his head and the placement and the condition of his hand after the chiburi. Much of what I am teaching is there. I'm confident with what I'm teaching even though it might not jive with what others are teaching now. business which can pick up kids from schools and transport them to various locations for a fee. Kids on Wheels Transportation Service.